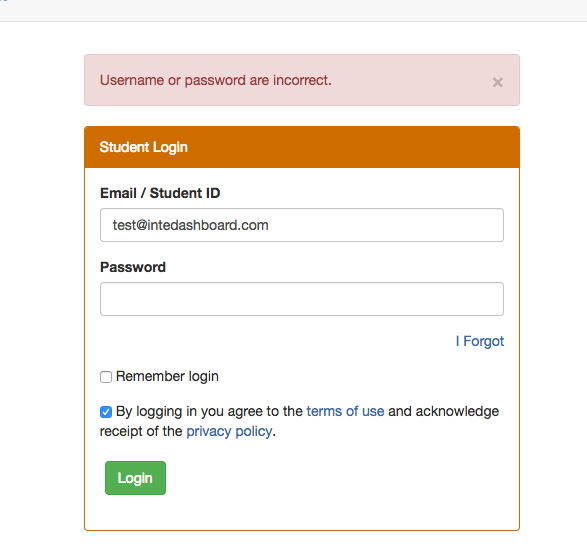 Here are the quickest ways to get around commonly faced student login issues. Having trouble logging in? Browse through the scenarios below to see if any of them matches the problem you are facing. If your teacher has enrolled you with your email, you should have received an email with login details, similar to the one in the image above. Haven't received the email? Follow these instructions. Scenario 2: You tried entering the login details you received, but you received an error message. In this scenario, we assume that you received an email with your login details and tried entering them into the student login page. On trying to enter your login details, if you see an error message saying "Username or password are incorrect" like the one below, follow these instructions. Scenario 3: You're able to login, but you don't see any course on your home page. If you see a page like the one above where you don't see any courses on your home page or you don't see the right course on the home page, it probably means that your teacher has not added you to the course. Email your teacher and request them to add you to the course! Do none of these scenarios describe the problem you are facing? Email us at support@intedashboard.com and we'll be in touch!